The demand for interesting Chinese artifacts shows no sign of slowing. 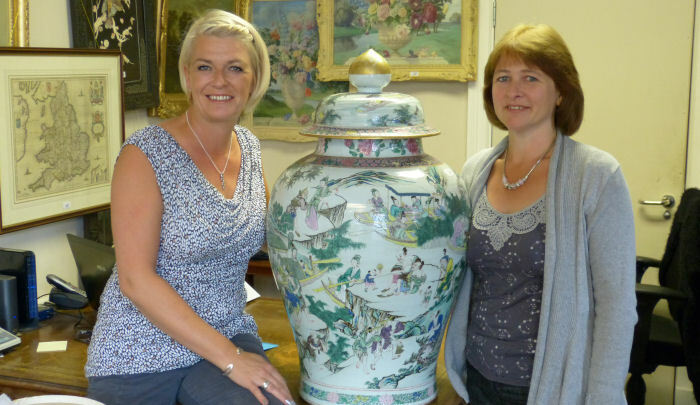 When P.F Windibank sold a Yongzheng period 18th Century Large Bulbous Lidded Floor Vase at their 7th September auction, although it was based on a later stand, it`s oriental figures, boats and floral & scroll decorations caught the imagination of buyers from China, Hong Kong and London. Although showing some wear and tear given its long history with some cracks and chunks missing, this incredible piece was still an excellent example, having been kept in a local family who had decided to instruct P.F Windibank to sell as part of a probate estate, testament to the strength of the generation long relationship the family had with P.F Windibank. Following it`s initial viewing on Thursday 5th September, multiple telephone lines were booked for the auction. Twelve bidders took the initial price to £17,500 before two competitive bidders continued to push it to £50,000. On the very last bid, and at his top price and final instruction, a top London dealer became the delighted owner of this vase. Needless to say it was picked up early and has taken up it`s new residence in a London dealership.